Another truck-front, housing several types of succulents; I love the mossy tangle growing through the truck’s windows and the diverse foliage and leaf shapes. 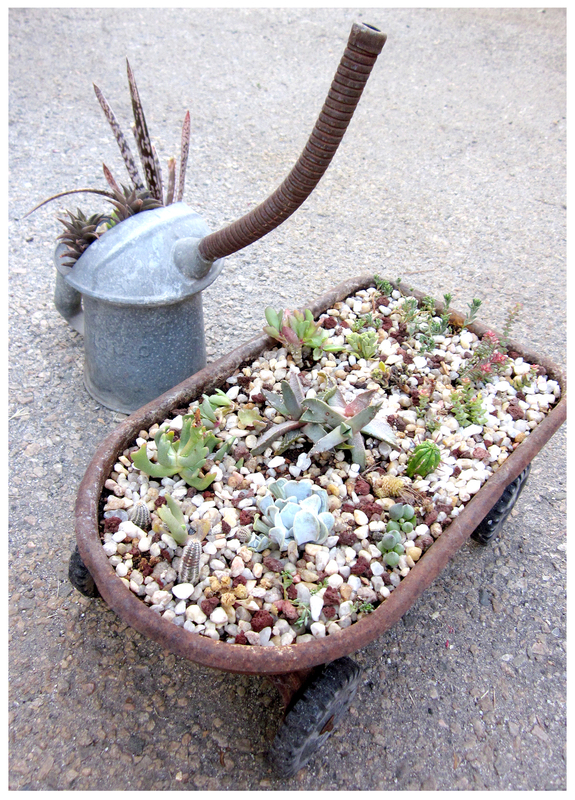 A vintage oilcan with a bendable siphon erupts with spiky juicy leaves, while a child’s toy wagon has become a roving garden plot. 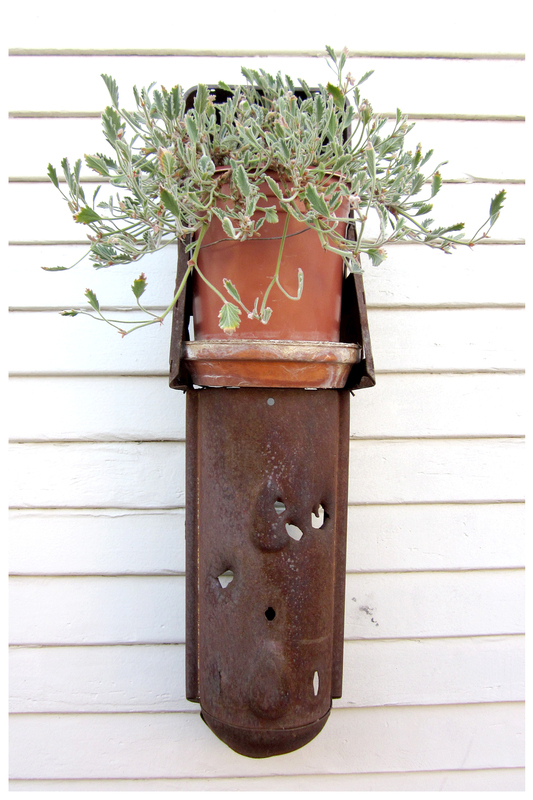 That stand-out siphon tube and those chunky wheels add whimsy to the succulent equation. 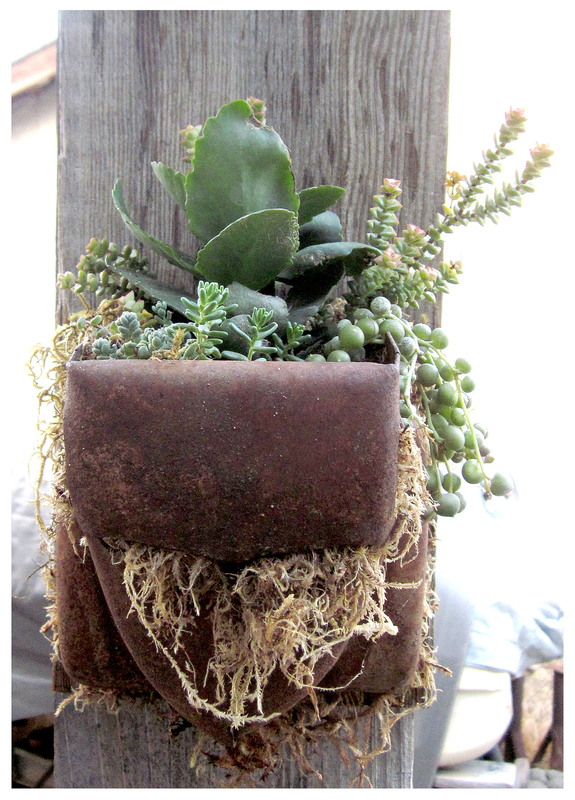 Vickie and Tom’s yard is chock-full of amazing, unexpected vignettes; here a vintage water bottle holder makes an attractive pedestal for a fuzzy-leafed succulent. A young peasant boy in knee breeches minds his own business at right. 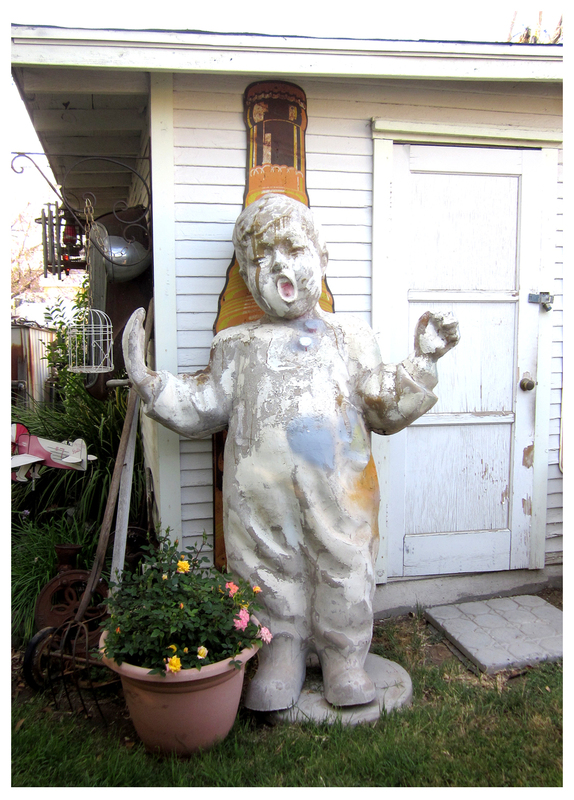 And, speaking of amazing, a life-sized Fisk Tire mascot stands sleepily against the wall of the garage. Missing his standard-issue tire and candlestick (see print version here), he’s distressed but absolutely beautiful. That ‘thou shalt not covet’ commandment was continually being shattered at Vickie and Tom’s place: I was lusting for so many of their things. I made an overt offer for some rock-like cement blocks they had, but they wouldn’t budge … the blocks had a sentimental backstory for them. Drat! Quite a few of the things on display at Vickie and Tom’s had a vintage automotive connection. From signage to actual car parts, there are evocations of bygone California highways at every turn. I particularly loved the complete auto grills hanging on the garage’s wall; they have an almost anthropomorphic quality, like studious and pensive metal faces. Near our visit’s end, Vickie flipped a switch and the re-wired headlights of one grill lit up … Again, covet overload: I want this amazing outdoor light sculpture! 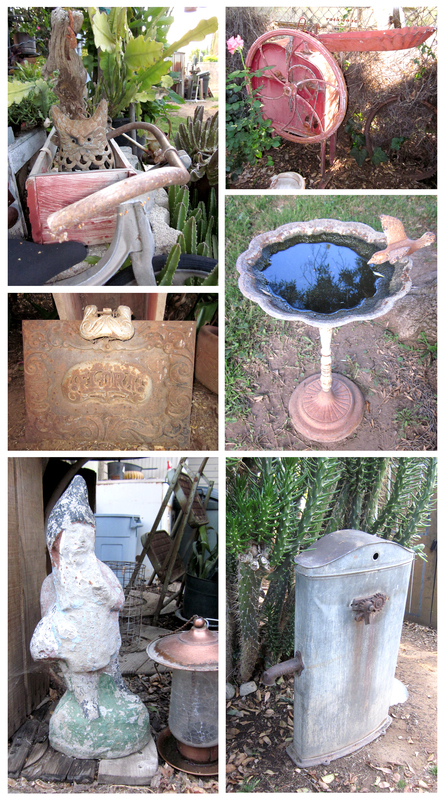 Vickie’s yard also featured these intriguing sights: A cranky owl lantern glaring over the handlebars of a vintage bicycle; a red metal farm machine showing great form; a charming old birdbath with a permanent drinker; a large, upright water tank; a fantastic, deteriorating garden gnome; a swirly, rusty oven door with the word ‘FLORA’ cut into it … there was just much to see … Vickie herself was striking with intense blue-gray eyes. Both she and Tom were charming and loquacious; they had stories for everything … we just had to point. Both are clearly artists; Vickie pointed out that she has always been involved in some type of creative endeavor, and Tom artfully restores vintage toys and pedal cars to a lustrous candy-colored splendor out of their garage. I enjoyed our visit immensely and it gave me an idea. I’m planning to have a sale at the Rancho! On offer will be garden items I couldn’t live without (but haven’t used), as well as other objects; Vickie’s rusty delights; plus one succulent seller and another purveyor of garden objects. I’m still trying to figure out when the best weekend for this sale might be but you can bet I’ll announce it here. 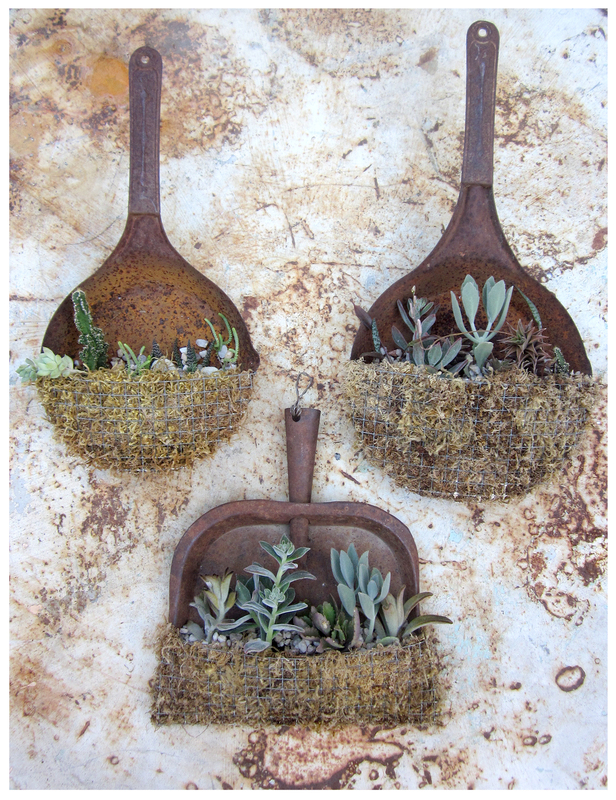 I can’t wait to have this sale so we can all share our love for all things succulent and rusty! Too funny! I came to your blog today to get the address to link to it a post I’m working on about a visit to rusty paradise. I was saying that I thought of you while there…and now I see your doing a post about your lust for rust. What a great coincidence! You would have LOVED shopping where I was…you’ll have to pop over and check out my blog later in the week. Sounds awesome, Loree! 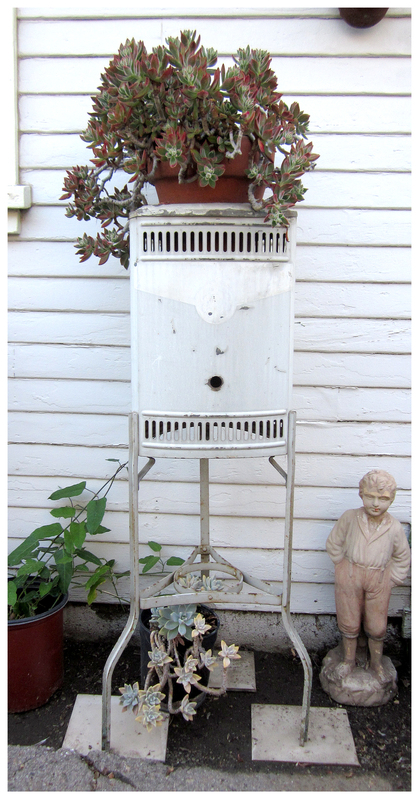 I can’t wait to see your post… sometimes I think my rust-lust is getting out of control … I wish everything were oxidized! Hey, Denise, I will definitely be having the sale, I’m just trying to figure out which of my fave succulent vendors I want to include … I think it’ll be fun and a great chance to pass along some things! Wow, Reuben, this was the motherlode. I was lusting after everything they had myself. Definitely going to repost…more people need to see this. Thanks! Very cool stuff. I’m in Riverside…didn’t hear a thing about this Picker’s Paradise. Will definitely want to attend your sale. I’m working on my own succulent collection. Hi, Kim, welcome to the Rancho … I actually found out about Picker’s Paradise on craigslist, and by accident. Keep checking in for news on the sale! Hey, Matti … when’re you guys coming down south again? Maybe that’s when we should have the Rust+Sucs Sale? Really cool peeps, I spoke with Vickie again and she’s given lists to her friends of rusted things they should be on the lookout for. She’s collecting planter material for the sale. Love it! What a fabulous visit! Always fun to see how other folks combine things. I agree… and to find other rust-lovers was a treat! 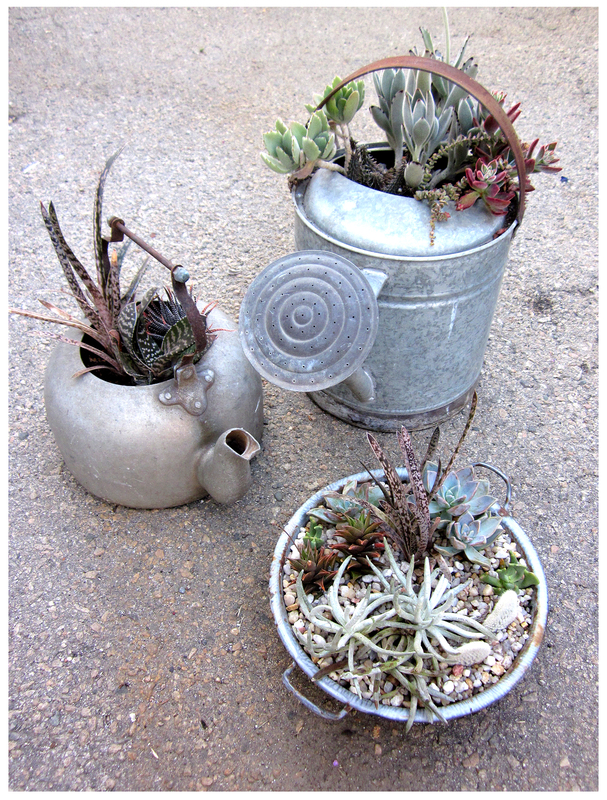 I would like to thank all for the comments about our goodies and my planters. Am pleased that things I started doing to amuse myself is giving others smiles. In the process of making more as folks help me find bits and pieces. I am looking forward to the sale and meeting more like minded people. I’m looking forward to the sale, too, Vickie! …and can’t wait to see what you come up with … thanks for commenting. I have lived across the street from Vicki and Tom for 20+ years now. I am glad to see someone has recognized the talent I have watched in them over the years. We always knew them as the people with the cool antique gas pump in the yard. Over the years of getting to know them and see their amazing creativity and art, it doesnt surprise me that someone has stumbled onto this hidden treasure that can appreciate who they are and what they do, if not only for their own joy of creating. Listening to you two is a little scary! I’ll do my best to live up to your expectations. I do think that a couple of ideas I have will tickle your fancies. Now to get these pieces I’m working with to cooperate and become what I’m seeing in my mind’s eye. Vickie, I wish you nothing but luck but my advice is: have fun! Just do what feels good and have fun with the materials … I can guarantee the best stuff will come out of your endeavors if you do! Thanks! I’m sure that all these “pieces” I’ve got staring at me will eventually tell me just how they want to go together. The trick is to get them to agree with what I’m seeing in that mind’s eye that I mentioned before. Ha! My stuff pushes back whe I’m putting things together too — Nice to know I’m not the only one working with pushy stuff! I so agree! I had to quit earlier beause we didn’t agree on who was going to be where. 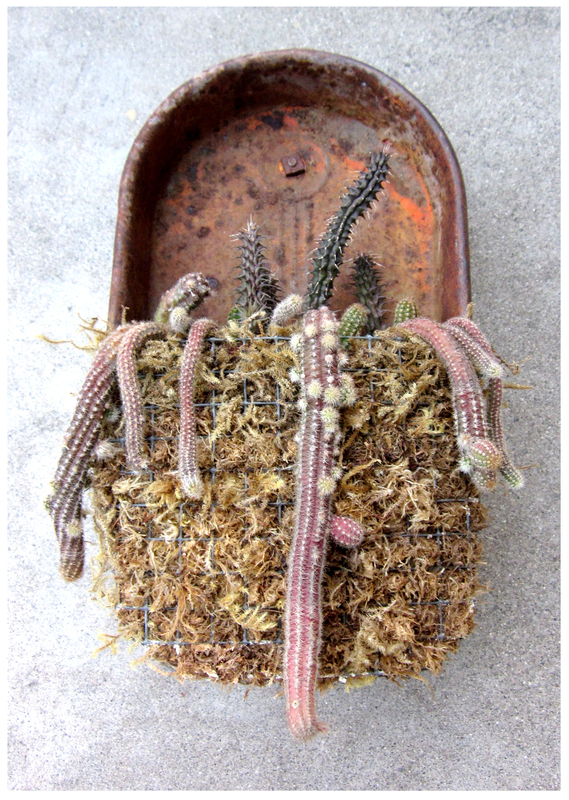 Especially uncomfortable with some of these prickly ones. Oh well, it’s what I get for becoming fond of these types of plants. Ha! A disagreement with a prickly one … happens all the time here… and I’ve got the scars to prove it! Just got home from Downtown Farmers Mkt. Heard that you were just at the succulent dealer there. Had to get some of his plants on sale to help fill in my planters. I’m not wanting to totally strip my yard. Anyway it was fun. It seems the more I learn about these the more I like. Especially the stranger the better! Anyway it would have been good to see you. HI, Vickie … Mike Dignan, the succulent guy, is a friend and in fact he’ll be selling his great plants at our sale in September. Sorry, I missed you at the the Far-Mar! I have gotten plants from him in the past and have always enjoyed talking with him. He mentioned your sale when I said something about making these planters and your sale. As I’m sure that you noticed that I’m a bit of a blabber mouth when I get excited when talking with someone who also enjoys what I’m doing. It’s nice to know when this sale is to be.. I’m glad there will be time for all these new plantings to take hold and be growing strong. I’ve managed to get some of them to cooperate with me and go into the places I want them. Could it be the influence of the full moon? Didn’t folks to say to plant with the phases of the moon? 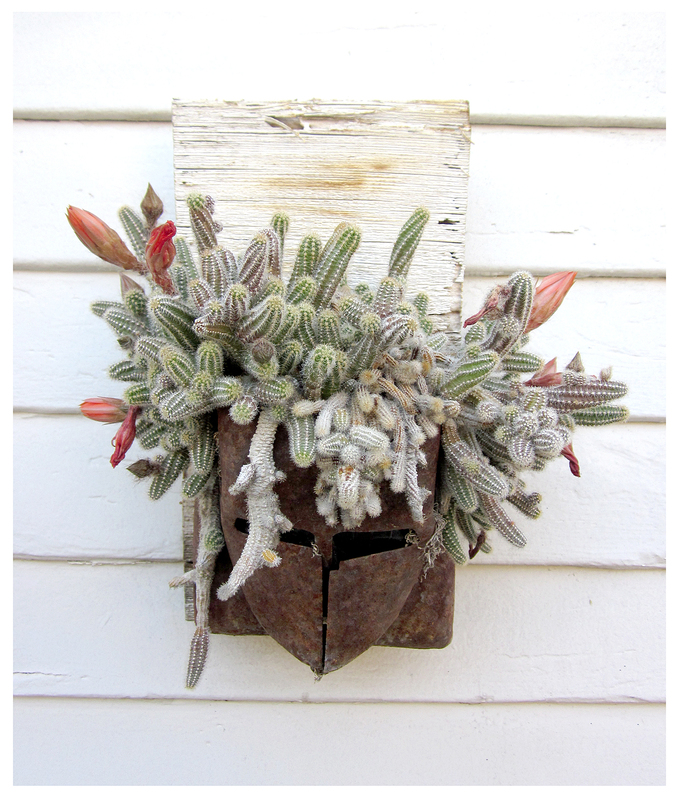 Anyway, we’ll see if it works with succulents. Thanks! I have been told that I talk too much enough that I let it carry over over into other areas. My Mom used to say that when I got excited that I would get oral diarrhea. She sure was right. And I’ve never out grown it. Oh well! I don’t blame you in regard to the heat! I tend to try working after dinner or when the heat starts to cool off. But then you get the bugs. But I manage with bug lanterns. I hope that September will cool off. With the long spring, here’s to hoping that summer doesn’t copy it! Maybe I shouldn’t have said that….